Update 1: Official Samsung Galaxy Note 5 user manuals are available now. You can download and read them in your language from this page. Update 2: Galaxy Note 5 how-to guides page is available now. You can get detailed guides on how to use Galaxy Note 5. On August 13 2015, Samsung announced the 5th generation of Galaxy Note phone: Galaxy Note 5 (together with Galaxy S6 edge+). In Asia, Galaxy Note 5 has been available 2 days later (August 15). In US and North America, the release date is August 21. If you are a long term Galaxy Note device user, you will notice Galaxy Note 5 was announced 2-3 weeks earlier than its predecessors. All previous generations of Galaxy Note phones were announced in IFA Berlin (International radio exhibition Berlin, Berlin Radio Show). The event usually starts from last week of August or first week of September. Galaxy Note (Note 1) was announced in IFA Berlin 2011, Galaxy Note II in IFA Berlin 2012 (August 29, 2012), Galaxy Note 3 in IFA Berlin 2013 (September 4, 2013) and Galaxy Note 4 and Note Edge in IFA Berlin 2014 (September 3, 2014). But this year, Samsung desperately rolls out Galaxy Note 5 earlier due to competition of the 5.5″ iPhone 6 plus, and the upcoming S version of iPhone 6 and iPhone 6 Plus next month. So, Samsung not only announced Galaxy Note 5 three weeks earlier than IFA Berlin 2015, but also released it immediately. It used to take Samsung 1-2 months to release Galaxy Note devices after the device was announced. many Galaxy note users may wonder what the new features of Galaxy Note 5 are, and whether you should get this new Galaxy Note device. To help you understand Galaxy Note 5 better, two posts are prepared. This post shows you the new and cool features in Galaxy Note 5. The other one will focus on flaws of Galaxy Note 5. Galaxy Note 5 looks fundamentally different from Galaxy Note 4 and other older Note devices, although Galaxy Note 5 and Galaxy Note 4 share similar 5.7″ screen. The new design of Galaxy Note 5 follows Galaxy S6. And, sadly, the design also reminds you about iPhone. Galaxy Note 5 also says bye-bye to plastic (or faux leather). Metal and glass are used instead. It look gorgeous. The unique point of Galaxy Note 5 design is the curved back. All Samsung Galaxy devices have a flat back, including Galaxy S6 edge which has curved screen in front side, not back. The curved back reminds you Motorola design for Moto X or Moto G. But Galaxy Note 5 is only curved near the frame/edge. So, it still looks very different from Moto devices. This curved edge in the back actually is far more useful than the curved screen (edge screen) in Galaxy S6 edge+, or Galaxy S6 edge. It makes it is very easy to hold Galaxy Note 5. Galaxy Note 4 supports fast charging, but not wireless charging. Galaxy S6 comes with fast charging and wireless charging. Now, Galaxy Note 5 gives you fast charging, wireless chargingand fast wireless charging. The fast wireless charging is absolutely new for smartphones. Galaxy Note 5 and Galaxy S6 edge+ probably are the first duo to get this feature. You can simply enjoy fast charging with wireless charging. 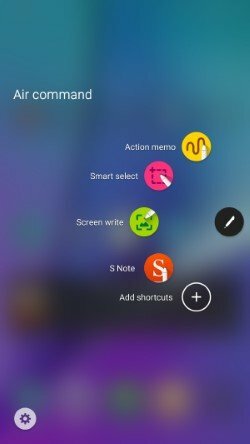 S Pen is the signature feature of Galaxy Note devices. Of course, Samsung continues to improve the S Pen features in Galaxy Note 5. New S Pen design. There is a serious flaw in Galaxy Note 5 design. You may accidentally insert the S Pen in wrong direction, and this will damage the S Pen slot. Please read this page for details. You can customize air command menu by adding your favorite apps to it. Scroll capture. You can take screenshot for multiple screens to cover whole web page, not just current screen. Screen off memo. You can write memos on the screen without turn the screen on. We will prepare individual guides to show you how to use these cool features. For the front camera, compared to Galaxy Note 4, Galaxy Note 5 upgrade the camera sensor. You can take 5MP selfies. A jump form 3.7MP in Galaxy Note 4. The rear camera in Galaxy Note 5 has a similar 16MP sensor with OIS as you have in Galaxy Note 4. Pro mode. You can have detailed control of your photo. Camera quick launch. You can launch Galaxy Note 5 camera by tapping home button twice. Quick launch works even when the screen is locked. Tracking AF (auto focus) for you to take photos with moving objects.. RAW support in Pro Mode. For advanced users, Galaxy Note 5 can save photos in RAW format. This means you have the full freedom to edit the photos after they are taken. You are not limited to effects and filters. You can travel back and re-adjust camera settings. Live broadcast. You can broadcast yourself live through YouTube in Galaxy Note 5 camera app. You can set the broadcast as private (only invited contacts can watch) or public. It is up to you. Compared to Galaxy Note 4, Galaxy Note 5 is equipped with 4GB RAM (3GB in Note 4), faster 64-bit processor (Octa-core Exynos 7420). These surely boosts the performance of Galaxy Note 5 significantly. Another improvement in Galaxy Note 5 is the UHS 2.0 storage, which is about 2-3 times faster than other smartphones with eMMC storage. This is actually one of the excuses of removing micro SD card support in Galaxy Note 5. Galaxy Note 5 also updated to touch-based fingerprint sensor. In Galaxy Note 4, you have to swipe your finger across the home button to register your fingerprint. In Galaxy Note 5, you need just touch the home button. What do you think about Galaxy Note 5? What are your favorite features in Galaxy Note 5?